If you meet the hum problem. Please just make T10 erect on the desk. Or make the T10 far from the desk 20cm at least. Then the hum will gone. Don't flat on desk close as the list picture. 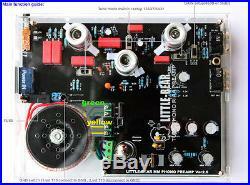 HN Little Bear T10 Pro Tube valve Phono Turntable RIAA Preamp preamplifier V2.6 (Package 36N2 + 16Z4 tubes). Current the PCB board color is: BLUE, not black. NOTIC: just work for MM (Moving-MaganeticCartridge) turntable only, not support MC truntable. PCB is finished and all electronic components are already soldered. The panel and transformer, you will need assemble by yourself to complete the unit - easy work! Upgrade log: 02th-Dec-2015, the Newest version. Thanks for you guys suggestion. 1, re-design the Gain swtich function. Before , it was through adjust output voltage to reduce output signal. We through control V1 tube to setup Gain. 2, add 3 tube cover for 3 tubes. More reduce the back noise then before. Just in case for safe. 4, add a GND connect switch, that switch function is: setup the T10 direct connect to GND through power cord, or disconnect GND. Default it is set to connect to GND. If you connect T10 to your digital amplifier or other AV amplifier and got loud noise. You can try to set this switch in "disconnect T10 to GND", that's because. Asymmetric ground noise, now we find out that problem and solved it. More information of this phono preamp. Not let you know down, else. If you have any suggestion for this preamp. Fell free message to me. If it's good suggestion, i will keep it. And upgrade that function in next version. It's a pure valve phono preamplifier. Sound is warm and classic, clearer and truer sound is restored. 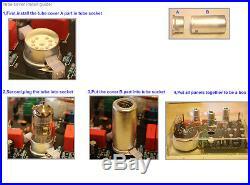 Coupling capacitors all using HiFi WIMA audio capacitor, best model. Very low noise and clear sound output. 3x 6N2 tube(low noise tube) +1x 6Z4 tube. 5, Weight:1.95KG, Size:25619070mm(10.077.482.75inch). 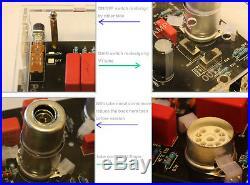 6, support 6N2/12AX7 tube, you can find more replacement tube for it too. For example:6N2 can replace 6H2,6H2n, and 12AX7 can replace:12AX7B, 6N4(9PIN), ECC83,5751.... More, (Normal T10 just support 6N2 tube and package 6N2 tube, T10-Pro version is package 12AX7 tube,). 6 x panel (assemble to be a box). 1x transformer(110120v or 220240v), you need wire it to PCB board by yourself. Without power cable(because it's over 2KG if package power cable cable). This is the newest pure valve phono preamplifier. This class A preamplifier provides a beautiful and very warm sound output. Gold interface - I tested it with my old classic Pioneer turntable and the music reproduction is fantastic, better than the T9 model. The sound is warmer, clearer with a lower background noise. It will not let you down. This is the real HiFi version. If you previously owned a turntable - now it's time to revisit the classic! 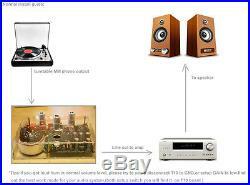 Q: Some buyers ask me : why not build a metal box for this phono preamp? 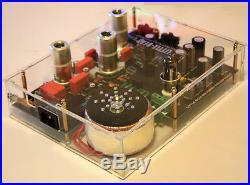 Metal case is available for a few counrtries only, but I think I need to share this preamplifier to more fans like me and that's way we use the acrylic panel, this way the unit can weigh less than 2KG. If you're a DIYer, you can build a metal case by yourself. We can provide the dimensions file to you. I'm pleased with my design - I hope you enjoy it. 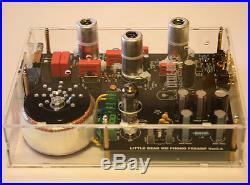 Acrylic case box for Little bear T10 preamp. In normal is with some low humming noise. You can try follow step to be sure is in lowest. 1, Must be sure the the GND point is connect to real earth. Using your finger touch the GND point. Is the humming noise come to lower? That's mean the GND cable not in good connect, if the humming noise is same, no change lower. 2, Using some better audio connect cable, and move this valve preamplifier little far from power or TV or other Electric device. 3, Connect the transformer case box to GND too. The transformer with 110120V and 220240V both version. I will sent correct version to you by your address. RIAA freq response 20hz-20kHz +/- 0.5dB, S/N ratio >92dB THD <0.05%, input sensitivity 3.0mV, gain 50dB. Nominal / max output 300mV / 1.8V. Output impedance 200 ohms, input 47k ohm / 220 pF. To see why this feature is a MUST HAVE! The item "HN Little Bear T10 Pro Tube valve Phono Turntable RIAA Preamp preamplifier V2.6" is in sale since Wednesday, December 02, 2015. This item is in the category "Musical Instruments & Gear\Pro Audio Equipment\Preamps & Channel Strips". The seller is "wfqxgw" and is located in ShenZhen. This item can be shipped worldwide.